A lot of children love pesto - partly, Nikki suspects, because bought versions are often rather salty. This recipe contains only the salt that's present in the cheese and is therefore considerably lower in salt than many commercial varieties. It's fragrant, tasty and very, very versatile. Pine nuts are traditional, but you can use any nuts as long as you grind them finely. You can even use ground almonds, which work really well. Alternatively, you can leave out the nuts altogether and make the pesto with lightly toasted breadcrumbs instead - in which case, it might need a little more oil. You can vary the herbs as well - parsley is particularly good. Preheat the oven to 180°C/gas 4. If you're using whole nuts or breadcrumbs, spread them in a small baking tray and place in the oven for 5–10 minutes, until lightly toasted – check them often as they can burn quickly. Leave to cool. Put the toasted nuts or breadcrumbs, or ground almonds, into a food processor, along with the basil, garlic and grated cheese. Blitz to a paste, making sure all the nuts are ground finely. Then, with the motor running, slowly pour in the oil until you have a thick, sloppy purée. I normally find 100ml oil is enough but you might want a little more. 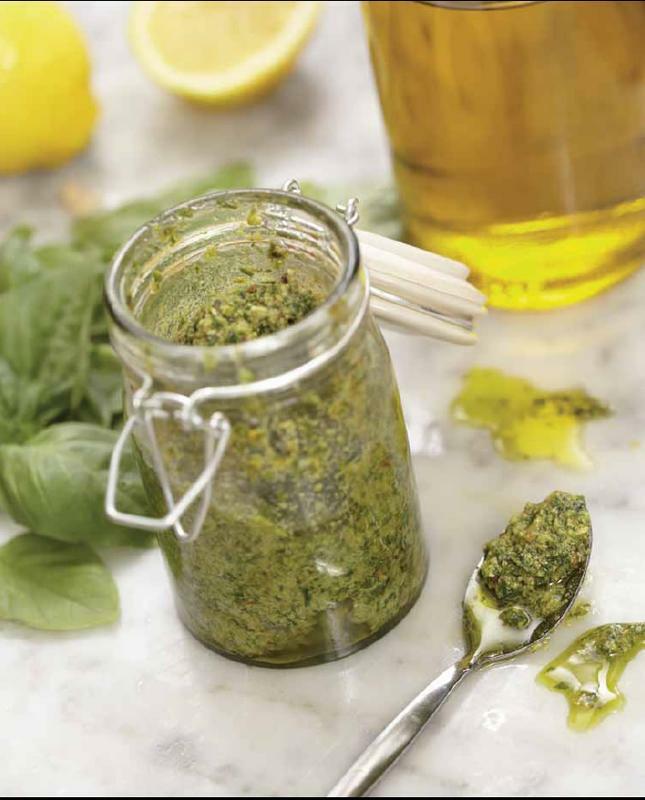 Scrape the pesto out into a bowl or jar and season with a good squeeze of lemon juice and some black pepper. This will keep, covered, in the fridge for a few days. Apart from being a delicious sauce for pasta, a dollop of pesto is lovely stirred into soup, in sandwiches, as an addition to salads, and alongside plain-cooked fish. For babies: Make sure you process the nuts really finely, or try the ground almond option.